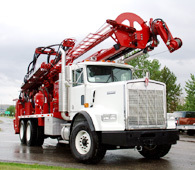 Water Well Drilling, Kalispell Montana – Allwest Drilling Inc.
With over three decades of water well drilling experience Allwest Drilling is your private well specialist in and around Kalispell Montana. Allwest Water Well Drilling will ensure your drilling project is handled professionally and efficiently. We have the knowledge and personnel to complete the water drilling project on time, every time. We provide water well drilling services in Kalispell, and the surrounding communities. Allwest Drilling makes every effort to insure that the water well placement meets the minimum set back requirements for all state and local agencies to protect your new water well from possible contaminates. Allwest water well drilling can also assist you with the complete design and installation of your water system. From drilling a hole, to filling a glass, Allwest Water Well Drilling, located in Kalispell Montana can assist with all your water well drilling needs.